Church Street’s new spot, Mandarin Box, does comfort Chinese options in an open-air ambience. Plus, their meal in a box is a definite winner. 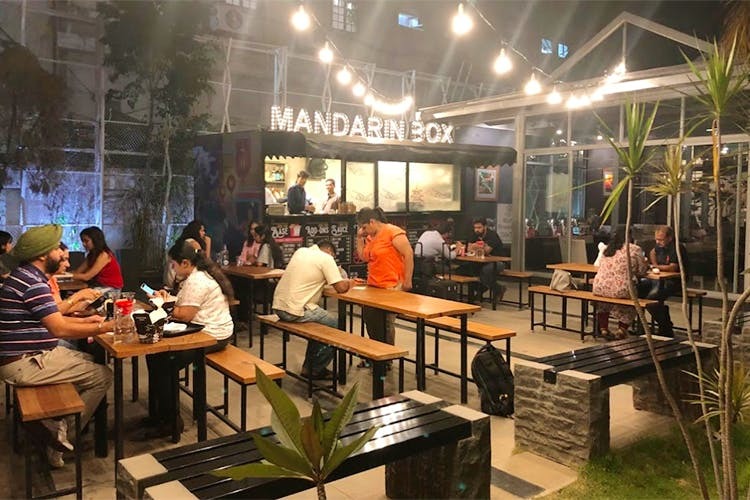 When you step into the open-air space of Mandarin Box, you will be welcomed by community tables, a small shack-like kitchen in the centre and plenty of greens. Situated inside High Gates Hotel, besides Roomali and The White Room, space works on a self-service model where you place your order at the kitchen counter. The menu is simple and offers comfort Chinese options in the form of meal in a box (noodle or rice), stir fries, momos, and chop suey of two kinds – American and Chinese. We are suckers for anything customisable and the meal in a box lets you create your meal in four easy steps. They hand you a paper form to tick your options. Noodles are Hakka and flat while rice is brown and white. There’s also a quinoa option. Your add-ons are quite extensive with chicken to beef tenderloins and shitake mushrooms to broccoli. Sauces include Schezwan (spiciest) and sweet & sour. The meal box works for any time of the day and for those of you who work nearby, lunch scenes seem sorted here. If you are feeling particularly ravenous or are with your friends, feel free to order the stir-fries that are greasy and soul comforting. Crispy Schezwan Veggies and Chili Potato any day while the carnivores of the group can feast on Chili Beef, Drums Of Heaven, and Salt & Pepper Prawns. Oh, fair warning to those of you who can’t handle spice, most of their dishes pack a punch. Skip anything Schezwan if you turn beet red at the sight of a chilli. There’s Coke and Sprite to cool your tongue just in case.